There is a great deal of spiritual power available to us over the next month. We are under the auspices of last week’s fascinating New Moon falling on the very last seconds of the final degree of Aquarius. This New Moon was so cusp-y that astrologers the world over debated whether it actually fell in Aquarius, the futuristic visionary, or Pisces, the sign of ultimate dissolving. In my direct experience and intuitive downloading, I have come to understand that it is BOTH. Pisces is the non-dual, mutable water sign of the Fishes where All Is One – no joke – and where Ultimate Power lies. 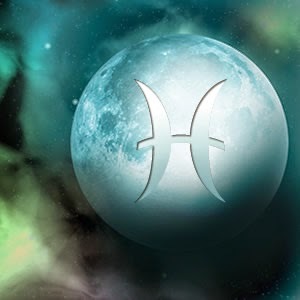 The New Moon tone of Aquarius brings the straightforwardness that can help us see the truth; the Water Bearer gives us the models, the tools, to surrender into Oneness without losing the plot. In the heavens right now, the major theme is surrendering the ego to What Is. And, on February 25 we have the Sun conjunct Neptune, ruler of Pisces, also in the non-dual sign of the Fishes, pointing to more letting go into the numinous plenum. Make no mistake: Pisces has an incredible amount of power and energy available as a mutable water sign. Think of the sea, her tides, and the force of a tsunami. It’s all fine and dandy in oceanic Oneness but put a monumental push behind it and you’ve got yourself a major life and earth-changing event. This prepares us for the ultimate evolutionary ratchet forward as we are building up to the final exact square of Uranus-Pluto on March 16. Remaining in the non-separate Cosmic Flow will make it much easier to accept the stretches, changes, and challenges this cardinal square summons in our individual and collective consciousness. As a result, a tremendous amount of spiritual power is in our midst, available to us when the small “me” simply gets out of the way. Apropos of last week’s Aquarius/Pisces New Moon theme, on Monday, February 16, we had the 24-hour celebration of Maha Shivaratri – great night of Shiva, one of the most important festivals on the lunar calendar. Shiva is the ultimate All-That-Is deity, dancing his eternal tandava of creation and destruction. With over one billion individuals in the world identifying as Hindus or followers of yogic traditions, even if we don’t know about Shivaratri, the impact of the festival is going to ripple out through the airwaves and reach our collective unconscious. One of the main legends of Shivaratri is the night of the marriage of Shiva to his consort Shakti (Parvati). 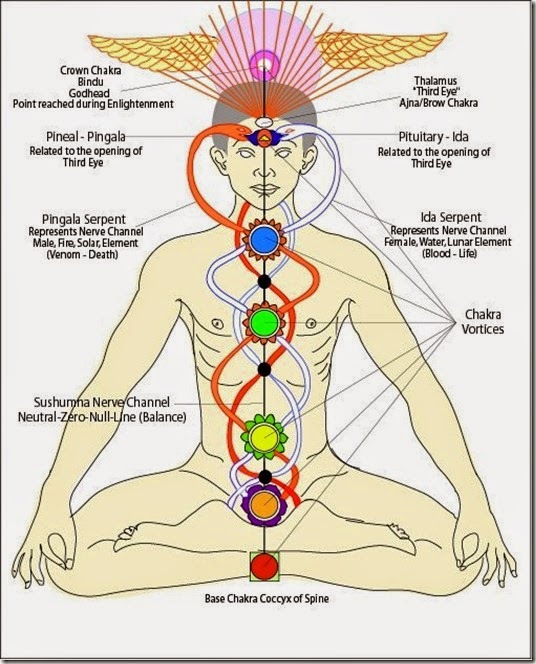 This is often symbolized by the intertwining of serpents, the Kundalini energy coiled at the base of the spine, in the root chakra. Kundalini rises up the spinal column through the sushumna nadi, which flows between the ida (related to yin) and pingala (related to yang) nadis. These are the male and female energy lines, or meridians, represented as serpents. 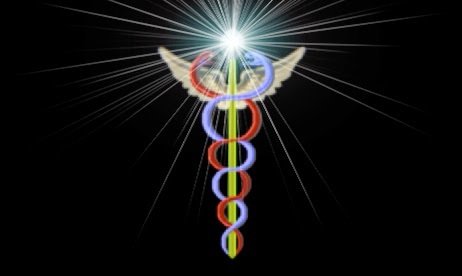 The rising of the Kundalini is a healing force in our body-mind and it is essential to spiritual awakening, which is why the caduceus symbol of medicine shows this very union. When the Kundalini completes purification of the energy centers, or chakras, in the body-mind organism, the two energy lines culminate in a marriage of Shiva Shakti at the Third Eye. At this point, enlightenment is available to the individual, and the crown chakra can open to receive graceful union with the divine, or cosmic consciousness. To facilitate the healthy flow of Kundalini energy – symbolized by this marriage of Shiva and Shakti, the intertwining serpents – we can clear out whatever is in the way of optimum flow in these energy columns. This increases the amount of spiritual power AND protection. During Shivaratri, and anytime it is intuitively needed, devotees and yogis often fast for one to several days to increase the amount of energy available to them to connect to the Divine. Cleansing is a great way to reboot the connection to Spirit, and to give the body a break. What is important is that you clear out whatever is in the way of creating space in that main central energy column – the shumana nadi – literally or symbolically. Take out the garbage – address relationships, finances, health, and household clutter. Consider it the most important spring cleaning you’ll ever do in your life. As Aquarian philosopher Ken Wilber says about authentic transformation: “The self is not made content; the self is made toast.” Surrender the small self to the Self – let go completely – and gain the Universe in return. 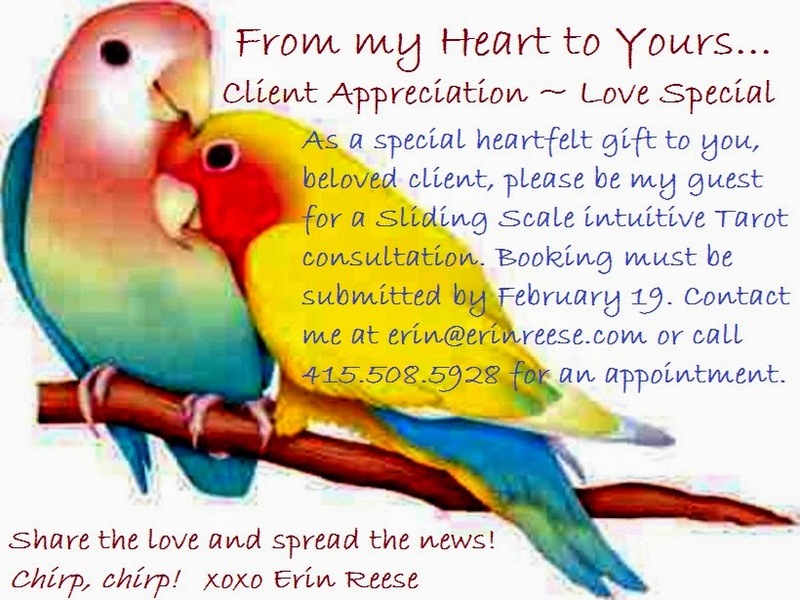 Erin Reese is an author, spiritual guide, astrologer, and modern psychic reader based in the San Francisco Bay Area. She works with clients all over the world. For readings and spiritual counseling by Skype, phone or email, contact her directly. She can be reached at erin@erinreese.com. *If you’re feeling a sincere pull toward awakening as discussed in this article, I’d be thrilled to support your calling. Find out more about my Spiritual Counseling series here. Tonight, we have a fiery Full Moon in the lionhearted sign of Leo. It is a fabulous influence, once we get past the overwhelming largesse of the whole thing. The Moon is conjunct the grand expander planet Jupiter, also in Leo, granting Luna emotional superpowers this week. Loving Leo is ruled by the heart. You may feel both the pain and the beauty of Big Love at this time. Most of us will feel the urge to self-express. Our hearts will be stretched wider, our emotions will range from tears to laughter to overwhelming joy to pure “Wow! I’m alive!” This is exhilarating stuff. 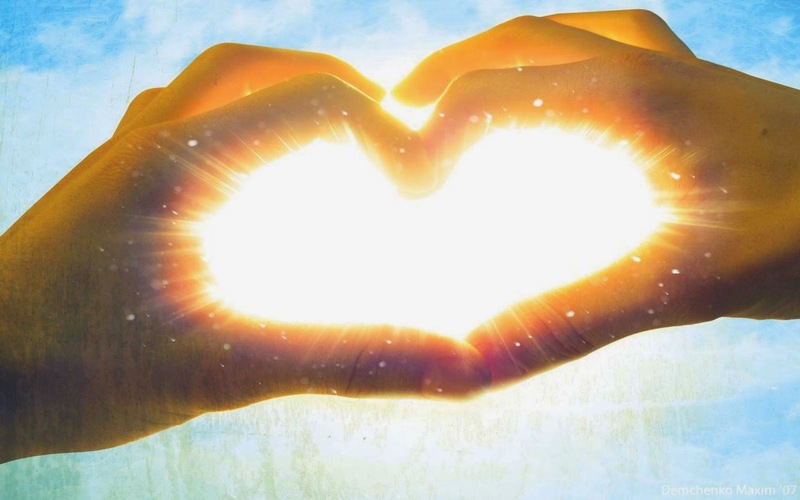 Our need to share the love will move us, no doubt, to great outpourings. Direct it to those who can receive, receive, receive your gifts. There is a karmic yod happening during this Full Moon, so some discomfort is unavoidable as we expand. A yod is formed when three planets form an isosceles triangle. This yod occurs between Pluto in Capricorn, the Full Moon in Leo, and Mars/Chiron conjunct in Pisces. A yod brings the need for major adjustments that are evolutionary in scope. We can expect deep, transformational (Pluto) healing activity during this Moon that may bring up past hurts with a potential sting (Mars/Chiron in Pisces). In other words, we are very likely to get challenged for our self-expression (Leo Moon). It is easy for an astrologer to say during a Full Moon in Leo to say “Go big! Shine bright!” Yes, but we have to protect our hearts, because there are the naysayers who will always feel the need to correct you. This is subtle undermining. Remember the phrase: “Those who can, do; those who can’t, teach.” If you find yourself tempted to get teacherly or preachy, giving unsolicited feedback, make sure you’re not alienating those who may just simply benefit from old-fashioned acceptance and love. And shield yourself from anyone else who tries pulling that buzzkill business on you. We still have Mercury in Retrograde until February 11, the fly in the ointment causing communication snafus. Perhaps you’ve noticed the old “foot in mouth” syndrome has been popping up, or perhaps you’re having a hard time thinking clearly. Mercury in retrograde can result in more misunderstandings than usual. Do your best to be quick-footed around sticky situations. Instead of reacting to create more of a landslide of arguments or hurt feelings, try being flexible. Mercury is in Aquarius, a fixed air sign. 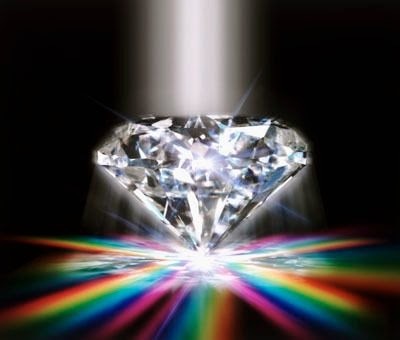 While brilliant in flashes of insight, this energy can be stubborn. 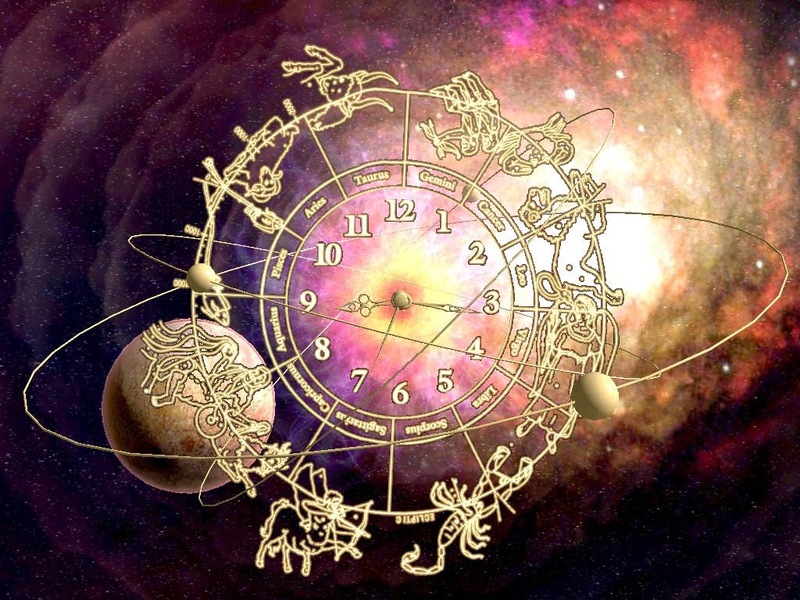 Aquarius can lean toward objectivity so much it forgets that feelings may be involved. People aren’t computers and even if you think you’re just being “right,” “clear,” or “correcting,” it can come across as insensitive or overbearing. Be especially cautious about the emails you press the Send button on. Read them over carefully first. There is a real human being on the other side. With the Sun transiting in Aquarius at this Leo lunation, the personal freedom to self-express is crucial, and it should be for the good of the whole. The bigger your light, the bigger the chance you’ll be criticized, the more flack you are likely to receive. Don’t pay any attention to it. If you’ve done your inner work, you’re connected to heart and soul. Your intention is pure, so soldier on. Keep expressing in your own unique, offbeat and upbeat fashion. Shine on, superstar. The love light of this Full Moon is gorgeous. Just like you.